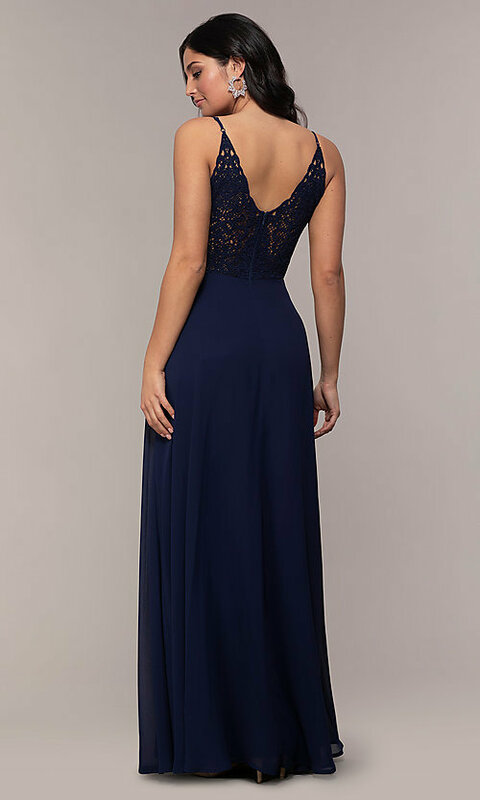 Here's a long v-neck formal dress by Simply with a beautiful crocheted-lace v-back design. The front of this chiffon evening dress has a classic wide v-neckline and thin spaghetti straps that adjust in back above the sheer lace. A jersey lining provides comfort and coverage beneath the floor-length chiffon skirt of the v-neck long dress. At under $150, this chiffon formal dress is an affordable and elegant style for charity galas, military balls, and other fancy occasions.